If all goes to plan, HTC and Valve could be the first to launch a full end-to-end virtual reality experience for our homes. It's difficult to overstate how important that moment is going to be when it happens. Over the last couple of years VR has struck back with a vengeance - this time, the technology is ready - with Oculus, Sony and Valve all set to roll out their headsets next year. We are on the eve of a virtual reality revolution. If it fails to launch this time, it probably never will. With the Oculus Rift becoming almost synonymous with virtual reality, it's odd to think that Valve's rival headset (though it wouldn't ever admit to being a rival if you asked it), the Vive, which came later to the race, could be first to market. Before Facebook snapped up Oculus VR for a cool $2 billion, Valve and Oculus shared a very fruitful relationship; Oculus had the hardware, Valve provided the software support. Then Zuckerberg landed himself Oculus and things changed: Valve, which had previously said it had no plans to release a consumer headset, announced it was entering the race and smartphone manufacturer HTC would be the one to build its vessel. Sources have suggested that this decision was made because of the acquisition. After all this, the irony is that Valve might now be in a better position than anyone else. Its headset is almost ready for market, there are controllers to go with it, and it even has unique 'room-scale' tracking technology to let you move about your living room while playing. A limited number of Vives will go out next month, with a wide release to take place before March 2016. But no matter how much spit and polish you put on it, Vive will be nothing without great experiences. Valve hasn't just spent the last three years working on Vive and SteamOS - so what is it preparing in terms of software? "Thats one of the things we're holding back to reveal more information about but there's going to be a big story and we're excited to share it," says J.B. McRee, Senior Manager of Product Marketing for virtual reality at HTC. 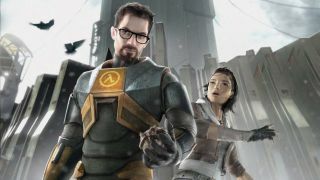 Could it finally be Half-Life 3's time to shine? Maybe a new Left 4 Dead? It's hardly a surprise that nobody is saying more than that despite being so close to launch - HTC wants everything about the Vive to be a surprise. "When we made the original announcement it was a surprise to probably mostly everyone," says McRee. "For us it was really exciting because, coming from smartphones, it's always been very challenging for us to bring a product to an announcement with people not knowing about it. "It's difficult for everyone these days. So we know the excitement that we gained from that so we're trying to make sure we can try to do those types of things again so as we start to have these announcements and things we want to talk about we want to make a big bang. "We're exciting to tell you, believe me." HTC started working with Valve on the Vive around mid-2014 (Facebook announced it was buying Oculus VR in March 2014, make of that what you will). "We had been working and looking at VR for quite a while - two years," says McRee. "They have been working on it for about three years." I asked how things might have been different had Facebook not bought Oculus, and whether we'd even be sat here right now talking about a competitor from Valve. "That's a difficult question to answer," responds McRee. "There's no telling, I think had that not happened the industry would be completely different. Think about how that changed the industry. The opportunity for Oculus to take off like it did. Like you said, for some people it burnt bridges. But for Oculus, what better opportunity for them to build something that's truly revolutionary? "I think it's important for the industry for people not to be too terribly competitive right now, because in order for VR to be successful everybody needs to be successful - at least in the beginning. "So we're not going out the door with much of a competitive aspect. We're obviously thinking about those things, but it's important for the industry for everyone to be successful, for the first products that roll out to deliver on a very good VR experience. That's a big weight on our shoulders, and we're taking that very seriously." That weight is shared across both HTC and Valve, which are working incredibly close to bring Vive to life. When conversations take place, both parties will be sat at the table making the decisions. "Even though we're designing the hardware, Valve has say in what that looks and from a performance perspective how that works," says McRee - and it works both ways. "We're very involved. Very, very involved. And there are things we haven't really talked about from a software perspective that we're excited to share as well, that I think people will be excited to hear."